Did Dell Overpay for Perot Systems? HomeBusinessDid Dell Overpay for Perot Systems? One of the biggest finance stories for Monday was the announcement by Dell (NASDAQ:DELL) who will buy Perot Systems (NYSE:PER) for a substantial premium. The deal should provide Dell with a more relevant IT services division and the combined entity will claim about $8 billion in services revenue. This proposed merger follows the example of Hewlett-Packard (NYSE:HPQ) who bought EDS (originally a Ross Perot Sr. outfit) earlier this year, as a way to accelerate their growth in services. 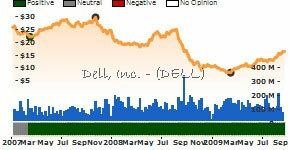 Dell has said that the all cash $3.9 billion, $30 per share acquisition will be accretive to earnings by 2012. There is little doubt that the deal puts Dell in more direct competition with HP and IBM (NYSE:IBM) for lucrative services contracts, which will help diversify Dell’s businesses away from hardware. Margins for hardware-makers have been in decline for years and IT services is a very profitable and expanding market. In Perot, Dell is instantly gaining market share in healthcare IT services, which is the source of nearly half of Perot’s revenue. President Obama has stated that modernizing medical records will be an emphasis of his administration, and Dell/Perot would stand to benefit from any such efforts. The concern we have is that Dell paid a steep price for the acquisition. The 68% premium over Friday’s close is massive, and we will never know if Dell could have bought Perot for less. We had rated Perot Systems as Undervalued as of last Friday’s price, as PER was selling for well below its historically normal ranges of price-to-cash earnings and price-to-sales. However, we think Dell might have been able to buy Perot perhaps for 10% less, and shareholders would have been more than pleased. Over the last year, Perot’s revenue fell by 8% in its healthcare division and 21% in its commercial division. Analysts are expecting Perot Systems revenue to shrink 9% for the year, but improving margins are expected to lift earnings by 2%. The proposed deal awards Perot a multiple of nearly 29x fiscal 2010 earnings, which is a very rich valuation in any market. We believe that this deal does make since for Dell strategically, as Wall Street has hammered them on declining profit margins from their laptop and server businesses. However, we think that the price is a bit too high, especially considering Dell management only forecasts cost savings of 6%-8%. It just goes to show you how badly Dell wanted to grab a bigger piece of the IT services market, and they are willing to pay for it. Dell still have about $8 billion in cash on hand, and their CEO has not been shy about saying they will look for more opportunities down the road, but the rich valuation paid on this one could somewhat limit its ability to negotiate on any further purchases. 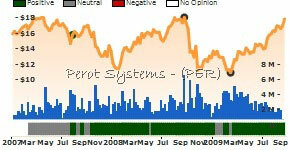 4 Comments on Did Dell Overpay for Perot Systems? Really going to be a great deal for the Dell in future.I dont think that Dell has Overpaid. Perotsystems is a good reputed firm in U.S and in India also,having its well versed branches in 4 cities in India.So finally i will call it a great deal from the point of view of both the Cos. I have been an employee of Perot Systems. Now i am happy since Perot Systems being acquired by Dell. Since i joined in Perot Systems, my salary scale have been in very low level and too inadequate in between necessary products price hike. We trust Dell would help us with good hike for year 2010. Its not only my trust, it’s trust of all employees of Dell. As RAM said our salary is very insufficient compare to price hike in necessary goods. We expect good hike will be in this APRIL. Thank you.